If you need to shed pounds in a hurry, then shedding water weight can be an effective way to get ready for that special occasion. 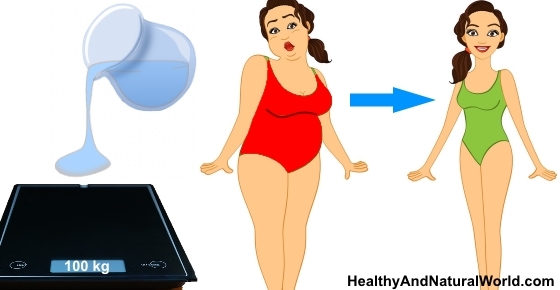 Most women panic when they notice a few extra pounds on the scale, but knowing the difference between fat and water weight can help you to understand your weight gain and it provides you with ideas on how you can shed those pounds. You can gain water weight easily and it tends to fluctuate on a daily basis. Fat takes longer to gain and longer to lose. If you’ve gained more than half a pound overnight then you are probably retaining water. Your body stores fat in various locations, particularly around the torso, arms, and muscles whereas water is stored in your capillaries, tissues, and body cavities. Water retention is often seen in the ankles, hands, and legs. If your wrists or ankles look puffy then chances are you’ve gained water rather than fat. If you have a body fat percentage meter or go to a gym, then you can measure your body fat to get an accurate idea of whether you’ve gained water or fat. Losing the water weight will depend on your particular reasons for storing the weight. Here are some tips on what you can do to encourage your body to shed those pounds. A lot has been written about the health benefits of drinking water. Your body use water to dissolve compounds like sodium and potassium to help to ensure the electrolytes in the body remain balanced, to filter waste from the body, and to support energy production. It may sound odd to consume more water in order to lose water weight, but if you don’t drink enough water, your body will start to store water to compensate for the lack of water. To help reduce the water your body stores, you therefore need to increase your water consumption. Try drinking eight to ten glasses of pure or filtered water on a daily basis to ensure your body releases any retained water. Don’t drink it all at once. The body cannot absorb a lot of water in a short time and I’ve already mentioned that drinking too much water can be dangerous. Sip water throughout the day to help the body absorb and use the water you are drinking effectively. I’ve also mentioned in my eBook Blast Your Belly Fat that one of the top 5 bad habits that cause belly fat is forgetting to drink enough water. As I mentioned above, water is the primary solvent of the body and is responsible for ensuring your electrolytes remain balanced. The main electrolytes in the body include sodium, potassium, chloride, and bicarbonate. For electrolyte balance to remain balanced, your diet needs to include balanced amounts of these electrolytes. When you eat too much sodium, the body needs more water to dissolve and ultimately remove the excess sodium and other waste from your body. This means your body needs to retain more water. According to the Mayo clinic, you should limit your salt intake to a maximum of 2300 mg of salt or less than 1500 mg per day if you are over 50. Salt is often a hidden ingredient in processed foods so make sure you take those foods into account when assessing your daily salt intake. Also include the salt that is naturally found in many of your foods like vegetables, milk, and meat. Reducing your salt intake can help you to shed those extra water pounds. When you eat foods high in refined sugars, your insulin levels are affected. Too much sugar increases insulin levels, which in turn reduces the body’s ability to remove sodium, which can cause water retention. Reduce your refined sugar intake and add high fiber foods to your diet instead to help regulate healthy blood glucose and insulin levels and to reduce insulin spikes. If you are looking for tips and tricks to quit sugar, read my article about the 13 most effective ways to quit sugar. A bowl of oatmeal in the morning or an oats based cereal can help you to feel fuller for longer and it can help to reduce insulin spikes. As women, we retain more water at certain times of the month. Knowing your menstrual cycle and monitoring your weight during these periods can help you to determine if your water weight is as a result of this natural cycle. You can reduce the effects of the cycle by ensuring you eat a healthy diet full of fruits and vegetables and ensuring you get sufficient exercise. Incorporating physical activities into your daily life is one of the habits featured in my eBook 70 Powerful Habits For A Great Health which will guide you how to take positive steps to improve your wellness and overall health. Exercise can also help you to shed water through sweating. Exercise is also one of the ways to increase circulation, release toxins and is also promotes healthy lymph flow in your body – all of these factors can contribute to reduced water retention. Sodium, potassium, calcium, and magnesium all affect how much water your body retains. A healthy balanced diet should include sufficient amounts of these vitamins and minerals. Taking supplements can affect the natural balance of the body but supplementation can be vital for some individuals these days (for example millions of people suffer from magnesium deficiency). Discuss your supplementation needs with your physician to create a healthy nutritional strategy for your individual requirements. The methods discussed above are healthy, natural ways to shed water. Some people use diuretics to relieve fluid retention by making you urinate more. Diuretics are often necessary for individuals who suffer from certain conditions, but you should avoid using diuretics unless you have discussed their use with your physician. Diuretics affect the balance of fluids and electrolytes in the body and this can affect your short and long term health.